Reflecting the availability of a new (so called "55/10") VDSL2 speed profile on BT's fibre broadband network, BT has increased the maximum download throughput offered on its BT Infinity 1 service to about 52 Mbps. Prior to the change, the BT Infinity 1 offering was based upon the standard "40/10" service provided by BT Openreach. This has a maximum downlink connection speed of 40 Mbps (equating to a throughput of about 38 Mbps). In January 2016, BT Openreach introduced a new fibre broadband product offering maximum connection speeds of 55 Mbps (downlink) and 10 Mbps (upload) - available to both BT Broadband and other ISPs. 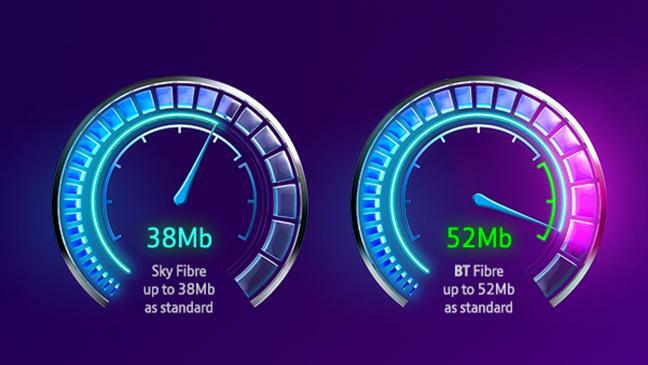 BT has now decided to offer the new service as part of its Infinity 1 offering, and has been promoting the increased speeds against the lower speeds currently offered by competitors. Customers already receiving the 40 Mbps maximum connection rate should be able to benefit from the improved speeds. The new speeds will benefit new BT Broadband customers immediately. Existing customers currently connected to the 40/10 service should be able to upgrade to the higher speeds, although this may require taking out a new contract. The 55/10 service is available to other ISPs, so it will be interesting to see if, and how many, other ISPs migrate their offerings to the higher speed service. To view BT's latest broadband deals, visit BT's website.